All Seasons Houseboats commenced (or floated) January 2005 and have grown steadily over the years. We are a family run and owned business starting with 2 houseboats in 2005 and have launched new boats annually now bringing our fleet to 14. 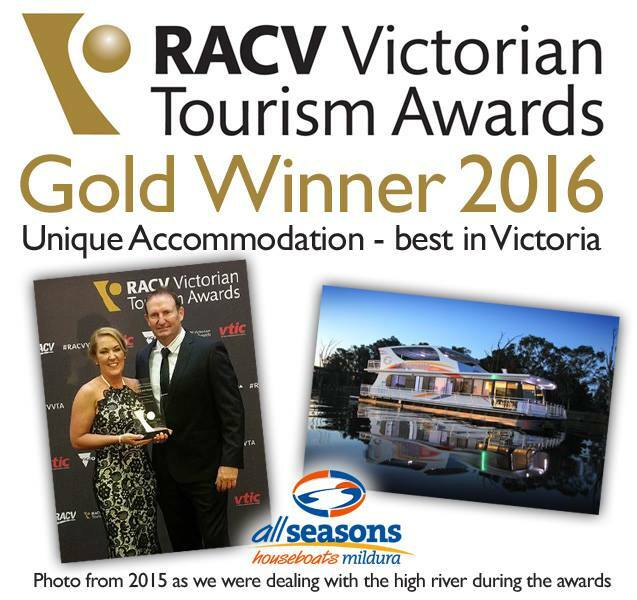 Most recently, All Seasons Houseboats won the 2018 Riverina Mildura Tourism Awards and the 2017 Victorian Tourism Awards for Unique Accommodation. We have also been fortunate enough to win the Victorian Tourism Awards highest honours for Unique Accommodation three times meaning we’re now in the prestigious Hall of Fame! All Seasons Houseboats are the most awarded houseboat company in the Sunraysia – Mildura region and offers exceptional product and service. Whilst more mature, the older lady’s of our fleet, Shannon, Quicksilver and Margaylea offer unbelievable value for money and still include all of the modern facilities discerning customers like yourselves require at a realistic price designed for smaller groups and families. These awards are a testament to us and our staff’s dedication and commitment to providing our customers with a unique, relaxing and enjoyable holiday experience!